California Dried Plums are a delicious fruit that is perfect not just for snacking, but for cooking too. 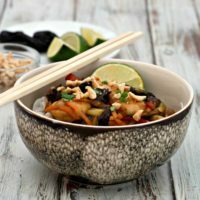 I recently made this Thai Shrimp Noodle Bowl recipe from the California Dried Plums Website, and it was a tasty dinner that the entire family enjoyed. 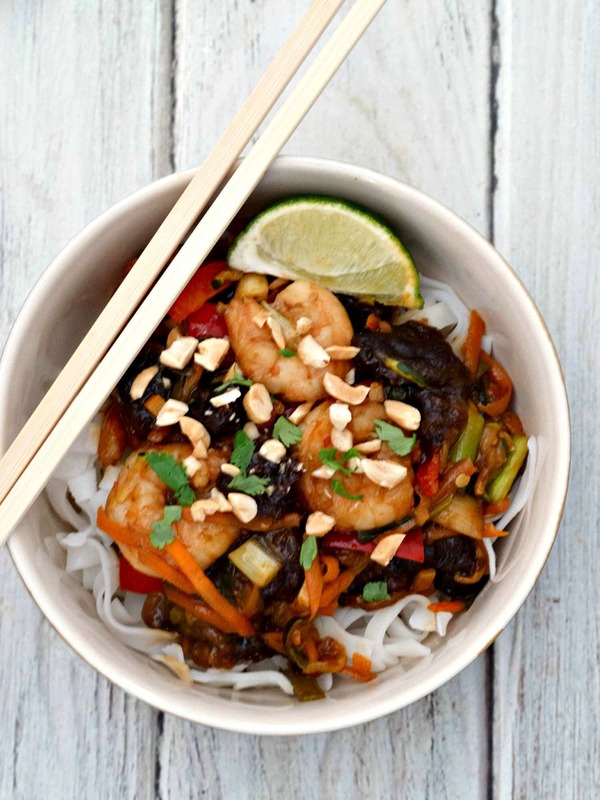 The recipe combines the dried plums with lots of vegetables like carrots, red peppers and scallions, and tops it all off with shrimp. I shredded the carrots and zucchini and cut all the ingredients finely for an easy to eat stir fry, suitable for using chopsticks. 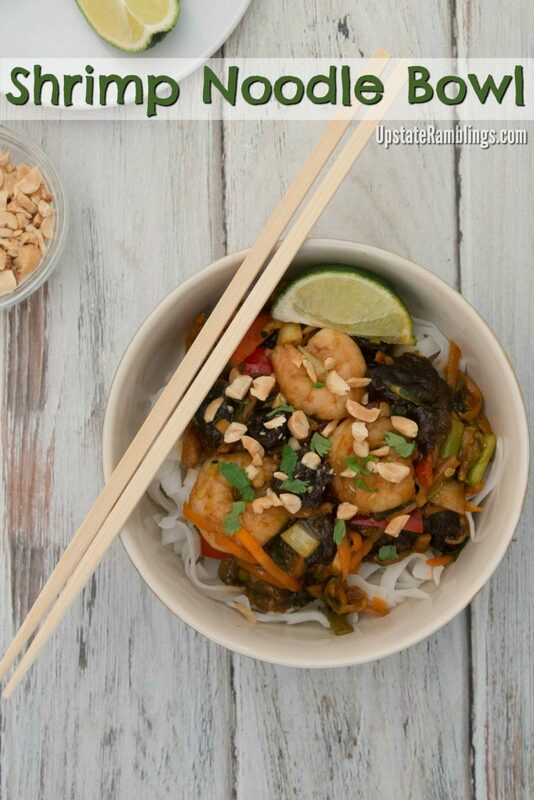 I served it over rice noodles, and it was delicious. The dried plums gave the stir fry a little bit of sweetness, which went great with spicy red pepper flakes in the teriyaki based sauce. My husband even commented on how much the plums added to the dish, and he rarely notices things like that! But my favorite thing about this dish was how quick it was to make. The entire meal was ready in 20 minutes, and that includes the time to chop up the vegetables. I love healthy, filling dinners that I can make for my family when time is short! In medium bowl, combine broth, teriyaki sauce, brown sugar, garlic, ginger and red pepper flakes; set aside. In large skillet, heat oil over medium-high heat until hot. 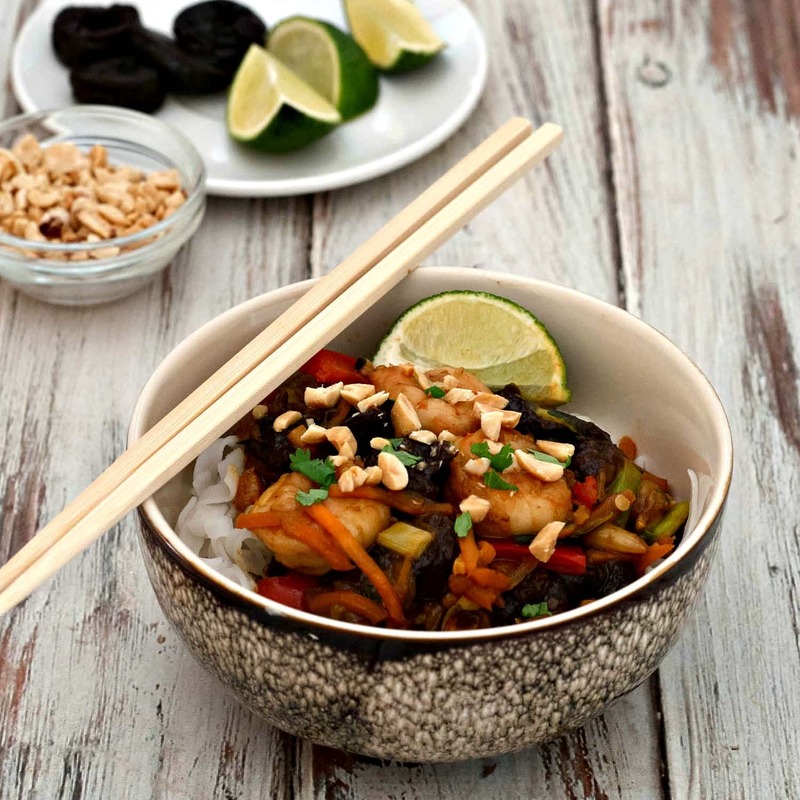 Add carrots and bell pepper; stir-fry 5 minutes. Add shrimp, dried plums, zucchini, green onion and reserved broth mixture; cook and stir 5 minutes or until shrimp is pink. 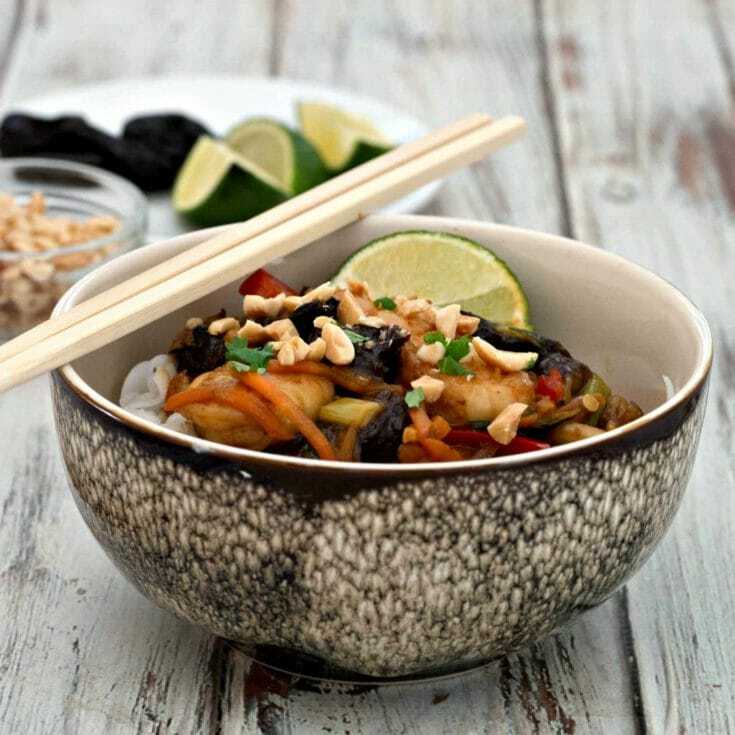 Serve in individual bowls over pasta or rice noodles and top with peanuts and lime wedges, if desired. There are lots of reasons to include dried plums in your meals. For example, incorporating California dried plums as a regular part of nutritious food choices may support healthy bones. They contain vitamins and minerals such as potassium, copper, boron and vitamin K which may have bone protective effects. Vitamin K helps improve calcium balance and promotes bone mineralization. A 40gram serving of dried plums (4-5 prunes; about 100 calories) is considered an excellent source of Vitamin K, which provides 30% of the 80mcg Daily Value. And they taste fantastic too! 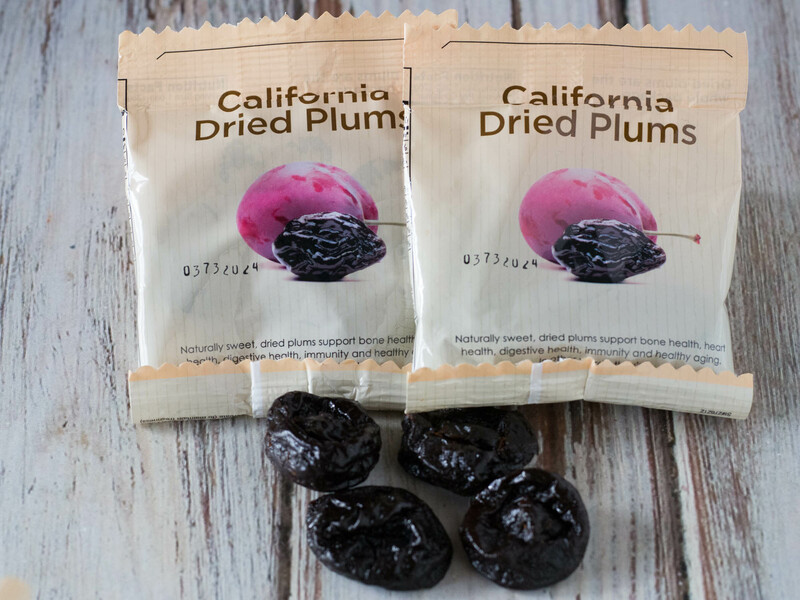 The California Dried Plum is a unique product, grown and harvested naturally and exclusively in the golden state. They are naturally cholesterol-free, and promote digestive health. In addition, dried plums may help manage weight through improved satiety perhaps by producing lower glucose and/or appetite-regulating hormone concentrations. All in all they are a great item to have around the house, both for snacking and for cooking. Check out the California Dried Plums Culinary Website and let me know what recipes you’d like to make with dried plums!